I do not accept returns. 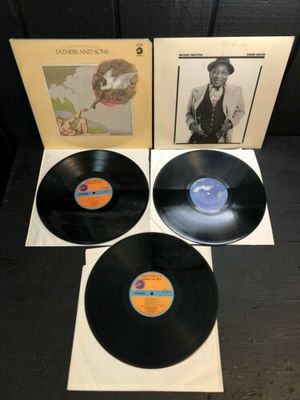 Please be sure of your purchase.This album lot is 40 + years old, has not been cleaned or professionally graded - just enjoyed as part of an extensive collection by a single owner/music lover. Album covers show edge wear, and imperfections. These vinyl lps have imperfections and visible marks- not warped. Vinyl lps show light scratches and are black and shiny. Comes with original sleeves that have wear and imperfections. FATHERS AND SONS: Double album. 2CH 50033 (17984). Cover has partial album rings on both sides, corner cuts and edge wear. Copyright 1972 GRT Corporation. Chess Records. HARD AGAIN: PZ 34449. BL 34449. Cover has partial album rings on both sides and edge wear. Copyright 1977 CBS Inc. Blue Sky Records.